The C400M uses the comfortable TP-2Z harness made in Nylon and fully adjustable, 3 release points with quick ejector snaps, pads on the shoulders, legs and chest, high position for reserve parachute connection D-rings, as well as cargo rings in the front and in the back. 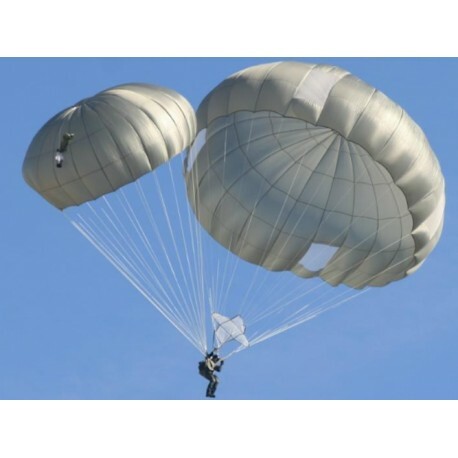 After 15 years of excellent performance of TP-2Z parachute system, CIMSA Ingeniería de Sistemas, S.A. has developed a new parachute system to meet the current trends of the most advanced paratroop units. 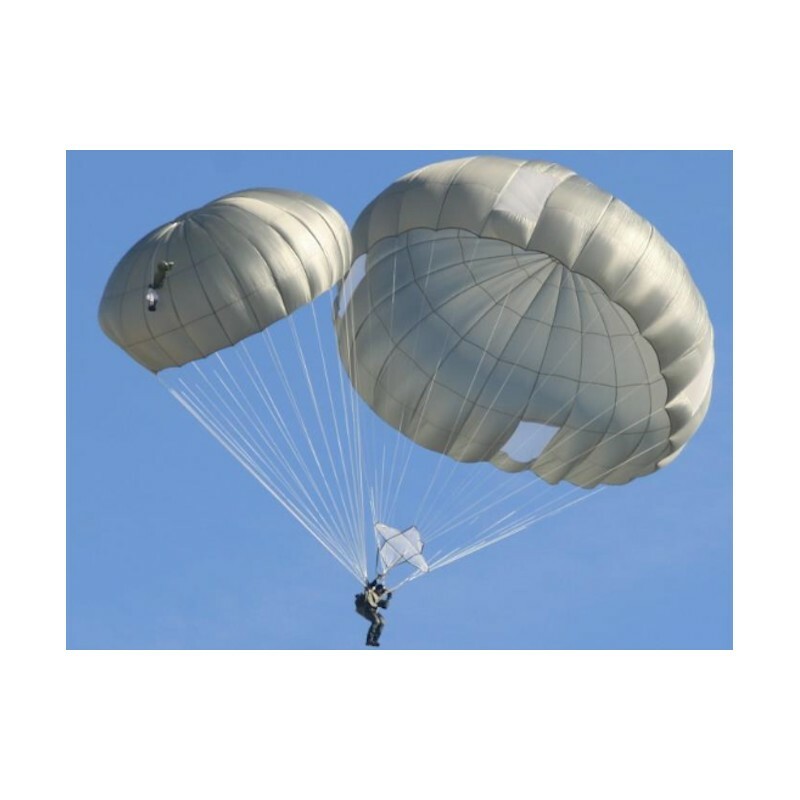 The use of large aerial platforms with high drop speeds such as the C-130, the C-17 or the A400M, the more and more demanding operational requirements, the heavier load to be carried to accomplish the mission and the need to improve the safety of parachutists regarding comfort, control, openings and landings, have been key points for the design of the new CIMSA 400 lb parachute system. The C400 Main Assembly (C400M) consists in a polyconic canopy 45-foot nominal diameter built in 24 gores of 0.5-3 CFM rip-stop, orientable through control toggles, without valve in the apex nor antiinversion net in the leading edge, Dacron independent suspension lines, 4 symmetrically positioned stabilization windows and slider, which allows the use up to 150 Knots with a descent speed of 4.92 m/s with 185 kg suspended weight. 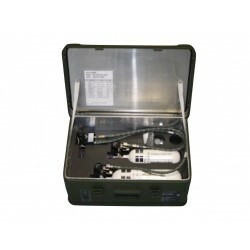 The new design of the C400M pack tray gives the equipment a completely different image from the traditional pack trays used in static line parachutes, and the connection with the reserve assembly is through 2 Alligator snaps. The deployment bag, manufactured in cotton, includes an improved stowage and protection system for the suspension lines that provides several advantages with respect to the traditional T-10/MC1 D-bags reducing packing time and physical effort substantially, because its two rubber bands rows, so no special packing tools are required. Both, the canopy connecting tape and the 15-foot static line are removable from the deployment bag. It also includes the new generation snap hook P/N 11-1-6991, with capacity to add a 5-foot extension static line. The C400R’s pack tray with 4 flaps offers a modern design with a central 1-pin textile ripcord grip with no need for elastic opening bands. The C400R reserve assembly includes a Deployment Activation Device (DAD) which consists in a low velocity pilot chute and an extraction spring pilot chute that run individually to ensure full deployment of the reserve canopy, in both fast and slow descent speed emergencies. It also includes the pre-installation of the newest Automatic Activation Device AAD SLS CYPRES 2 for static line parachutes. Both parachute assemblies, the C400M and its reserve C400R, maintain the standard packing, maintenance and repair procedures.